Small drones need to stay aloft do their jobs — whether that’s searching for dangerous gas leaks or remotely monitoring atmospheric conditions. But this effort can quickly drain battery-powered energy. A team of Harvard roboticists and a University of Washington mechanical engineer have demonstrated that their insect-sized flying robots, nicknamed the RoboBees, can now perch during flight to save energy — like bats, birds or butterflies. In a paper published in Science on May 19, they describe a switchable electroadhesive that enables a flying robotic insect to perch on materials such glass, wood or a leaf. This requires roughly 1,000 times less power than sustained flight. A swarm of insect-sized flying robots equipped with sensors could collect detailed information about air pollution, Fuller said, including searching for methane leaks that are a significant source of greenhouse gas pollution. But that will require energy-saving solutions that extend current flight times. Mechanisms that animals use to perch, such as sticky adhesives or talons, aren’t easily adaptable to a paper clip-size microrobot. So the team turned to electrostatic adhesion — the same basic science that causes a static-charged sock to cling to a pants leg or a balloon to stick to a wall. 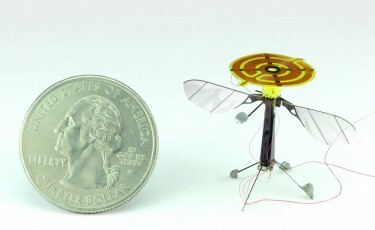 The RoboBee, pioneered at the Harvard Microrobotics Lab, uses an electrode patch and a foam mount that absorbs shock. The entire mechanism weighs 13.4 mg, bringing the total weight of the robot to about 100mg — similar to the weight of a real honeybee. The robot takes off and flies normally. When the electrode patch is supplied with a charge, it can stick to almost any surface, from glass to wood to a leaf. To detach, the power supply is simply switched off. The patch requires about 1,000 times less power to perch than it does to hover, which can dramatically extend the operation life of the robot. “When making robots the size of insects, simplicity and low power are always key constraints,” said Robert Wood, Charles River Professor of Engineering and Applied Sciences at SEAS and core faculty member of the the Wyss Institute, and senior author of the study. Fuller, who led the RoboBees flight experiments as a postdoctoral scholar at Harvard, joined the UW Mechanical Engineering Department in 2015. He will continue his research as part of The Air Force Center of Excellence on Nature-Inspired Flight Technology and Ideas (NIFTI) housed at the UW. He joins an interdisciplinary team of UW researchers working on animal-inspired flight control solutions that can be applied to small, unmanned or remotely operated aircraft. “One of the things I’m focusing on is how we can start giving these insect-sized robots the ability to perceive the world and control their own flight,” Fuller said. The Science paper was coauthored by Pakpong Chirarattananon, Noah Jafferis, Matthew Spenko and Roy Kornbluh. The research was funded by the National Science Foundation, the Wyss Institute for Biologically Inspired Engineering, and the Swiss Study Foundation. For more information, contact Fuller at minster@uw.edu. To receive copies of the paper and image/video permissions, please contact the Science press package team at 202-326-6440 or scipak@aaas.org. This was adapted from a Harvard University release.